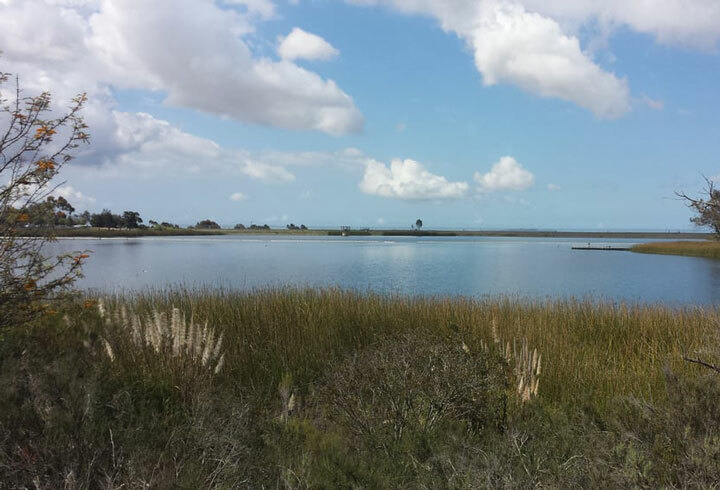 Perched halfway up the dry hills that overlook Mira Mesa and Scripps Ranch, Lake Miramar serves recreational pursuits such as boating and fishing. The paved road encircling the lake is popular with runners and other self-propelled travelers. On that road you’re never far from the water’s edge, and the coastal breeze, sweeping inland across the water, nearly always keeps you refreshed. Follow the nearly 5 mile, easy loop around Lake Miramar, starting and ending at the parking lot off Scripps Lake Drive. Like to count down how far you have left? This path offers markers every quarter mile for just that purpose. The lake makes for a picturesque view. There are usually plenty of other runners, walkers, bikers, and stroller-pushers along the path, so you’ll be in good company. Getting there: From I-15, exit at Mira Mesa Blvd and go east to a T-intersection with Scripps Ranch Blvd. Turn right and go south to the second light. Turn left on Scripps Lake Dr. After half a mile, you will see the entrance to Miramar Lake on the left. There is plenty of free parking along the south shore of the lake.